I'm coming from a computer science background. I wish I could have gotten into UC Irvine but I only wanted their ICS program and it was so competitive…so hard to get in…eventually so began the Riverside days for me. But looking back, I'm not so sure if they were "that bad". I had perhaps one of the most awesome experiences here. I came to Riverside as a transfer from LB State, all I wanted was a quality education and a life - something that LB State cannot deliver. If you think UCR's a commuter school you have not seen any of the Cal States - most of them are commuter schools, save for SLO and Pomona. Since the campus is 45 miles away from home, UCR qualifies for me as a residential campus and there's been some times that I stayed over here in Riverside in a number of weekends. If you really want a social life you won't find it here at Riverside. I have to admit, there's really nothing to do here so I had to look towards the various organizations that UC Riverside has in order to make it a home. Onwards to the academics. The computer science program may not necessarily be very recognized but they give you the basic education you'll need to compete in the world of computing. The job that I'm doing right now largely does assembly language level but, at least I had the assembly language learning that would be prerequisite on any other CS majors' list. I work with people who have finished their schooling at UC San Diego, USC and UCLA, and various "Big Name" colleges, many of them having forked out so much on student loans compared to the chump change that I paid during my Riverside days. And is the CS major challenging? It is, believe me. They even get you to program an OS kernel when you are up there in the upper division classes - just think about it when you get there! When you are done with the CS degree, expect to sound far more geeky than your peers. You'll have to try - just TRY - using actual English to explain how a computer works down to the bits and bytes. Many of the professors at R are always available - I wish I could have utilized more of their resources when I was there. But group-people networking is key. You need to know where are the best professors there are here. And there are good ones here. I perhaps might one of the few so lucky to be at where I'm at right now. 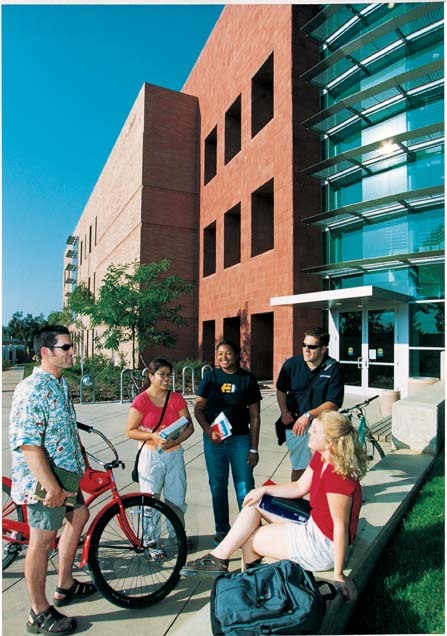 The student life in UC Riverside. Well, again, it depends how you make of it. Yes, there are some who fool around but then again, you'll find that at any college. Oh yeah, and the weather. Make sure to stay cool here. Expect 90-100 degree weather on summer days. The only plus at Riverside is the winter months. The weather is much cooler during htose months and I wished I could have taken up snowboarding while I was at Riverside because it's only less than 30 miles away from two major ski resorts. If you are looking to get into UC Riverside in hopes to get into the Biomed program later, be looking for an intense competition. Words cannot describe the disappointments of many friends I've known who were majorly disappointed to fight for the few spots available - and I mean, few. I'd rather be up all night coding for an assignment instead of stressing out about whether or not I'll get into the 4th year of the med program - but then again, I've wanted to be a programmer since I was young, so medicine may or may not fit the choices I wanted. Housing and dorms. When I first came to Riverside, dorms and rent were cheap. I'm not so sure now with the crazy real estate market that Southern California's been having - it's starting to get expensive now to rent an apartment over there. But compared to Irvine or LA, it's still cheaper. I stayed at Eastside Lothian for the first 2 years and that was before West was renovated. The dorm food is excellent on most days, so-so on others. I had Ethernet connections when I was there and I enjoyed it when sharing music was still "legal". So it all boils down to this: Yes, it is what you make of your education that makes you. I'm sure many of you are looking to get into the Big Name colleges but, you have to give Riverside a chance. I mean, I learned a lot here and you will too. Yes, UCLA will always have a better computer science program but then again, why so much the name? In the workplace, few care about what college you go to, it's the work experience that matters.